No. 12, Jalan SP 4/3, Seksyen U3, Subang Perdana, 40150 Shah Alam, Selangor, Malaysia. 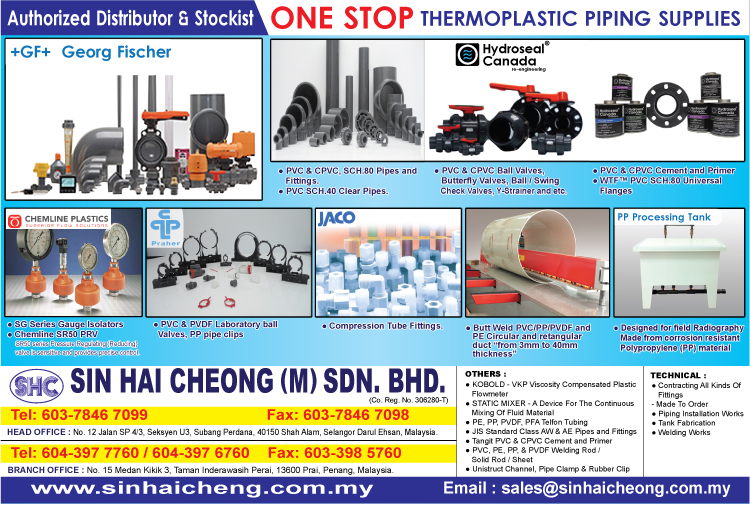 SIN HAI CHEONG (M) SDN BHD was established in 1994, specialized in distributing in thermoplastic pipes, fittings, valves and other thermoplastic related products, using materials such as PVC, CPVC, PP, PVDF etc..
Our Marketing Strategy is to provide our customer superior services and in order to do this, our sales personnel will reply our customer in the shortest period of time possible. We are not only selling goods to our customer but also provide services and solution to our customers.